dressed up like a lady: The Collar. Sorry for the holiday hiatus! I have lots of great pictures from Christmas, but while I'm busy resizing all those, here's a basic outfit post for you featuring one of life's simple, fashion pleasures: a button-up collar over a crewneck sweater. I can't possibly photograph this outfit without a creepy twin shot of me and MC. How's this for oversharing about our outfits: for YEARS, MC and I worked at the same office as I silently obsessed over him, secretly in love but entertaining not so much as the wish -- let alone hope -- that he would one day be mine. 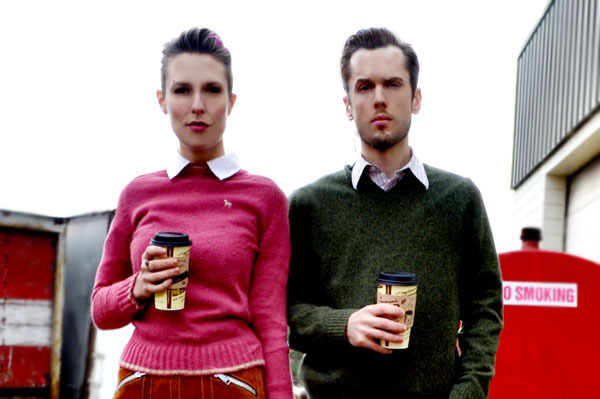 On frequent days when he wore a perfect, trim little sweater with his oxford collar peeking out, I looked on longingly and thought "Oh, to be Matt Collar's collar...."
The inspiration for a song I recorded with Bulletproof, the pop punk band I was in back in 2006. That was three full years before MC and I even started dating. I love the pink sweater with the suede skirt. Hi my fellow non-drinker :) You're looking cooler than an iceberg here. Love the OTK socks and that seriously timeless brown satchel in particular. Many thanks for your blog comment today, dear gal - hope you have a stellar New Year!!! Love that pic of you and MC! Have an amazing NYE in the city ~ starting the party early is a fabulous idea! love your shoes so much. say it again: I LOVE YOUR SHOES SO MUCH!!! hope you both had amazing holidays. - happy new year. Why you aren't an extremely famous songstress right now.... I have no idea. Every time I hear your voice, I mean....amazing...who do we need to call to make this happen? Awww i LOVE that sweater! And the twin photo!!! That´s such an amazing outfit, love the colours and the contrast of preppy items with your edgy haircut! The 'twin' pic is also pretty cool too!